The Thirteenth Gyalwa Karmapa, Dundul Dorje was born in Nyen Chawa Trong in the southern area of Tibet, exactly as predicted by the Twelfth Karmapa. He was born with the syllable AH on his tongue, the symbol of the essence of the Buddha’s speech. As a small child he told many stories about his previous lives and spoke about travelling to Nepal and India. He also had a powerful vision of the protector Mahakala, who told him they were inseparable from one another. It is recounted that as a child he was especially fond of animals and able to communicate with them. He was recognised at the age of four by Tai Situ Chökyi Jungne, who took him to Tsurphu Monastery. He was enthroned by Gyaltsap Rinpoche with the Black Vajra Crown of the Karmapas at Tölung Dechen Zong. 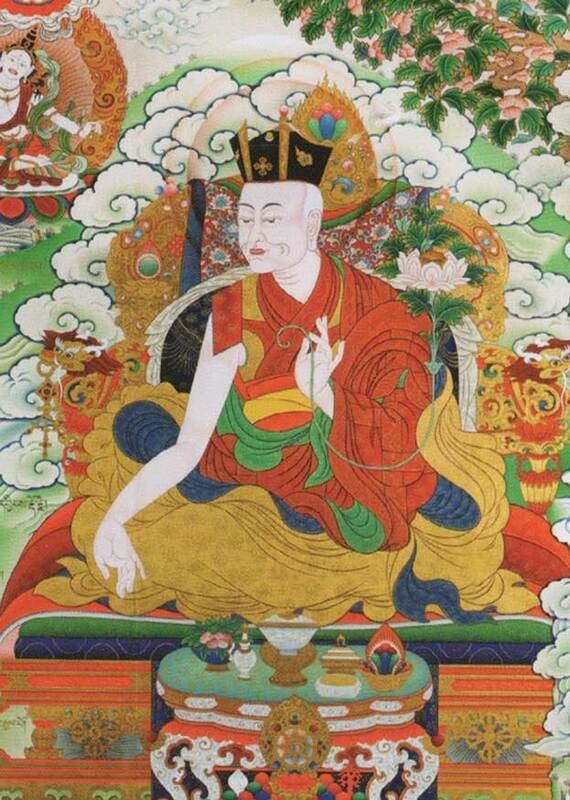 At the age of eight, he received the entire Kagyu transmissions from his root Lama, The Eighth Situpa Chökyi Jungne. He also studied with many great masters of the Nyingma and other Kagyu traditions, such as Kathok Rigdzin Tsewang Norbu, Kagyu Trinley Shingta, the Sixth Supreme Head of the Drukpa Kagyu lineage, and many other great masters. As prophesised by Padmasambhava, the famous Jokhang temple, home of the Jowo image, was threatened by floods caused by a naga. The Lhasa authorities, aware of Padmasambhava’s prediction that only the Karmapa could avert this disaster, requested him to come. Even though he was unable to respond to their request immediately, Dundul Dorje resolved the problem by writing a letter with blessings to the naga and invoking the compassion of Chenrezig. At a later time, upon arrival at Lhasa, the Thirteenth Karmapa offered a white kata to the Jowo statue. The Jowo moved its arms to accept the Karmapa’s offering and has stayed that way ever since. Once, when in Tsurphu, the Gyalwa Karmapa was asked to consecrate a distant monastery. The blessing grains he threw into the sky at the time of the consecration ceremony hundreds of kilometres away, were seen there to be showering down from the heavens. 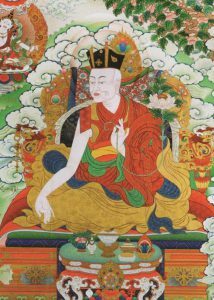 Together with the Eighth Tai Situpa, and Kathok Rigdzin Tsewang Norbu, Dundul Dorje recognised the Tenth incarnation of the Shamarpa, who was born in 1742 as the brother of the Panchen Lama. Amongst the Karmapa’s other main students were the Ninth Situ Pema Nyinje Wangpo, Dorje Dragpo Tsal, Tsuglag Chökyi Gyalpo, Sherab Gyamtso, Karma Yenlak, Khedrub Jigme Senge, and Kunzang Tenpai Gyaltsen. Leaving behind a detailed prediction and instruction letter concerning his next incarnation, the Thirteenth Gyalwa Karmapa passed into Parinirvana at the age of sixty-four. Situ Pema Nyinje became his spiritual heir.